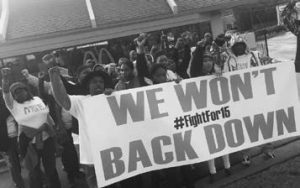 On November 29, fast food and low wage workers in over 300 cities across the US and the South went on strike demanding at least $15/hour and the right to form a union at McDonalds and other fast food restaurants. They were joined in these cities by home healthcare, childcare, airport, and other low wage workers and community members who have joined the Fight for 15 and, in many cases, have begun their own organizing initiatives to demand justice, higher wages, and unions in their workplaces. The day of action also elevate demands to end police killings of Black people and racism, and an end to deportations of immigrant workers. Major actions were held in Richmond, VA; Durham, NC; Atlanta, GA; Birmingham, AL; New Orleans, LA; Charleston, SC, and elsewhere throughout the region. 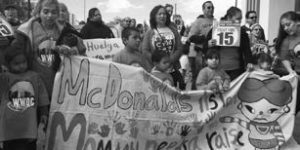 Hundreds of workers and community members across the South also engaged in civil disobedience during the strike to declare that, in spite of the obstacles and challenges that our movements face particularly in light of the outcome of the national election, we will continue to fight and won’t back down. 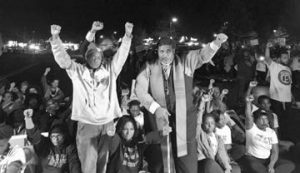 Workers in North Carolina were joined in civil disobedience both by Rev. Dr William J Barber II, president of the NC NAACP, and Rev Curtis Gatewood, Historic Thousands on Jones Street coordinator, along with other community supporters.